Recently I have had enjoyable religious conversations with a bright and earnest colleague. She belongs to a church that claims to have no creed but the Bible. As we have discussed various issues, we have discovered an interesting conundrum. One example: members of her church do not believe in the laying on of hands-even though that is a common practice in the Bible. When challenged about the discrepancy, members of that church insist that the biblical practice was a temporary one. Of course the Bible gives no hint that the practice was to end. So, in their view, the fact that it is not currently practiced must mean that it was a temporary practice. The net effect is that our experience and assumptions trump the truths of scripture. This is a problem for all people of all faiths. We are all selective in our study of scripture and idiosyncratic in our interpretation of it. It would seem that it is quite impossible to come to the Bible objectively. To remedy the problem, many faiths have creeds and doctrinal statements to try to provide a full and balanced view of truth. Each religious tradition has its own creedal lens. 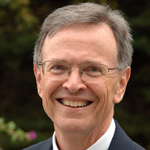 Richard Mouw, past president of Fuller Theological Seminary, challenges Christians to understand the teachings of the Bible “as developed and clarified by historic Christianity” (2012, p. 75). In other words, the proper lens for understanding the teachings of the Bible is centuries of Christian tradition. There were times in Old Testament history when godly people had no authoritative book to rely on in understanding the will of God. Noah, Abraham, Moses-none of these had anything like a Bible. God spoke directly to them. Similarly, in the New Testament and the early church, there was much reliance on oral tradition-the memories of what Jesus had taught and done, and later the memories of the teachings of the apostles. There came a point, though, when these testimonies were written down; and eventually those writings that the church came to see as supremely authoritative became-in the forming of “the canon”-our Bible. Christians became a “people of the Book.” (p. 63). Notice the interesting irony: Mouw acknowledges that the traditional way God has guided His people is through living prophets. Yet, as soon as God got His message said and people got it written, God seems to have clammed up. The heavens closed. Where is the biblical warrant for the end of revelation? Why should God’s time-honored method of guiding His people not continue? If there is any group that honors the process that gave us the Bible, it is the Latter-day Saints. We believe that God still reveals His will to prophets just as He has in the past. This gives the LDS a preposterous advantage! A living prophet can not only give us counsel for our time but he can also help us properly understand all that God has given in the past. While each Christian denomination has its set of favorite biblical passages, the LDS are guided by a prophet to know which passages God recommends as most relevant to us and our time. But scriptures alone may not convince the reluctant that God still speaks through prophets. Still the logic of guidance by prophets is strong: God has always guided His children through living prophets when they were willing to accept them. There is simply nothing in scripture that suggests that the blessing of prophets is time limited. I recommend that we rejoice in the sacred blessing of living prophets, that we study their counsel earnestly, and guide our lives by that counsel. (2010). Jesus wars: How four patriarchs, three queens, and two emperors decided what Christians would believe for the next 1,500 years. New York: HarperOne. MacMullen, R. (2006). Voting about God in early church councils. New Haven, CN: Yale University Press.